Sarah J. Maas answers our dreams in her new novella, giving us a glimpse into life in Velaris. The highly anticipated novella of the A Court of Thorns and Roses series is finally here, and has given us a beautiful insight into life in Velaris. On the darkest night, stars still shine. Feyre’s first Winter Solstice as High Lady is drawing near. With it will come a hard-earned rest from the work she, Rhys and their friends have done to rebuild the Night Court and the vastly changed world beyond. Yet the festive atmosphere can’t keep shadows from looming. Even as her own heart heals, she finds that those dearest to her have wounds that go deeper than she knew. And the scars of the past will touch her court in time to come. A Court of Frost and Starlight was a beautiful read, filled with new mysteries that I imagine will be unveiled in the new series. It both made me laugh, and brought tears to my eyes. I will always admire Sarah’s ability to bring about such a reaction. I also enjoyed settling into the familiar rhythm of Feyre’s voice. As far as I know, the new series won’t be told from her perspective, so the book was a good final glimpse of the world from her point of view. I think it wrapped things up nicely – we can be a little more ready to let her go, knowing the contents of the novella (although I’m sure we’ll be seeing her again in the future). I have to admit that I was a little disappointed with some of the writing in this book. I very much enjoyed the numerous points of view Maas has written from – including Mor, Cassian, and Nesta – however I felt some of them were lacking. In particular, I found Rhys’ point of view difficult to discern from Feyre’s – they sounded very similar. I would have liked more defining voices for each of the characters, so that we might know who has become the narrator without the need for a name under the chapter heading. Despite this, the different points of view helped to round the novella, in my opinion. It was useful and exciting to see into the lives of more of the characters. I particularly enjoyed the snippets of information gleaned from them – Mor’s chapter being a highlight. I thought it was good to see the relationships between the characters from their own perspectives – rather than Rhys or Feyre’s musings on them. As always, the descriptions were beautiful. Velaris has a permanent home in my mind now, and this novella has only brought it to life even more. Seeing how the city works on a day-to-day basis has been a glorious reprieve from the tension and hardship the characters have had to endure. Overall, I thought the writing could have been better. But. I thoroughly enjoyed the novella, as it gave us something that a lot of readers crave – a normal life for the characters. It was lovely to see how the Night Court works without the threat of war, and to finally see Feyre have some semblance of a normal life. Of course, there are things brewing, and more work that needs to be done – yet for now, we have been allowed to enjoy a small time of peace with them. All that remains left to do is wait in anticipation of the new series! 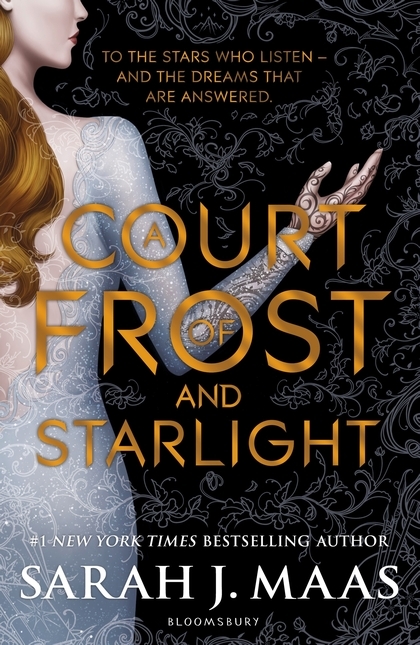 If A Court of Frost and Starlight is anything to go by, then it will certainly be an interesting read! Please remember that this book is not suitable for younger readers. It involves some explicit scenes and language, so be careful when purchasing! What were your thoughts on the novella? Are you excited for the next trilogy? My disappointment in the writing and characters purely comes from my wish that each character’s voice sounded more different than it does. Sometimes, I thought they blended into one. On the other hand, the theme was beautiful and filled my heart. I really enjoyed the serenity of the book – I am glad we were given a glimpse into everyday life. The plot was interesting – enough elements were added to make me look forward to the new series, and there was enough going on at the present moment to completely envelope me in the story once more.